Sure, you could refinish (paint) your cabinets, if you’re so inclined. You can do all of the more obvious updates – add granite, redo the floors, etc. But when it’s all said and done, those 36″ cabinets that you wish were 48″ will still be 36 inches. So, how do you go about adding that pizazz that comes from a designer kitchen, and how do you do it without breaking the bank – or your back? 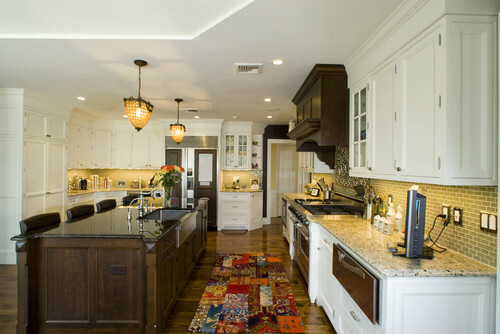 Well, there actually are several ways to get a customized look, even with the most basic of kitchens. With just a little bit of time and effort, any kitchen can have that pizazz. Also, there is no need to do everything all at once, as you would with a complete remodel. 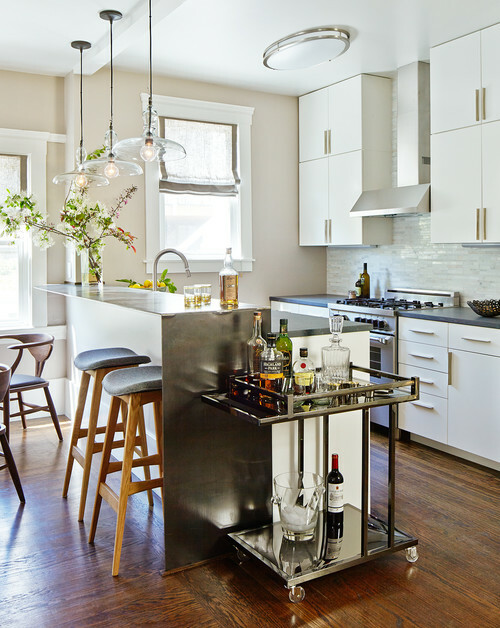 Just add one update at a time, and watch your friends and family ooh and aww over the changes with these DIY designer kitchen ideas. 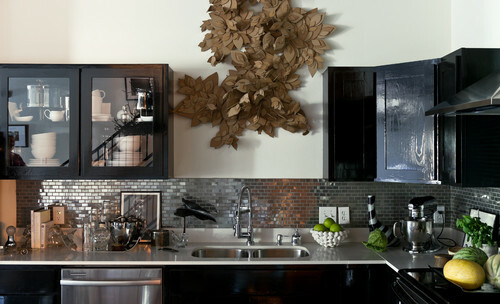 If you do not already have a tiled backsplash, this is the first place to start. Likewise, old dated tile can be replaced. Because it is such a small area to cover, expensive tiles aren’t really all that expensive here, and even a modest budget can really pack a big punch. Try to imagine the image above without that flashy tile. It would be a much less interesting kitchen. This kitchen demonstrates just how much can be done with a DIY update. The standard sized cabinets have received a black gloss finish, and the countertops have been changed out to a sleek stainless steel. But it’s the backsplash that really creates the impact. Another feature that creates a customized look is a tile insert. Consider adding one when the tile is installed. This can really add some eye candy to the design. If you have already installed tile that you are not willing to replace, consider adding a feature that sits proud of the backsplash (as shown in the above image). That’s right, these do not have to be recessed. I have done a feature similar to this many times over a pre-existing backsplash. A metal medallion is generally a good place to begin. 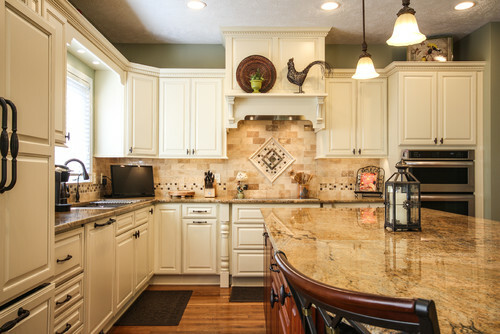 Then, choose a tile that matches your existing backsplash to build upon the medallion. Finish with pencil tile for the trim. No one will be able to tell that it was an afterthought. Consider changing old hardware out with a newer updated version. You will be amazed at how much just this little change can achieve. Even old cabinets can look refreshed with just this one simple improvement. Just as a change in hardware updates a look, so too does a change in faucets. 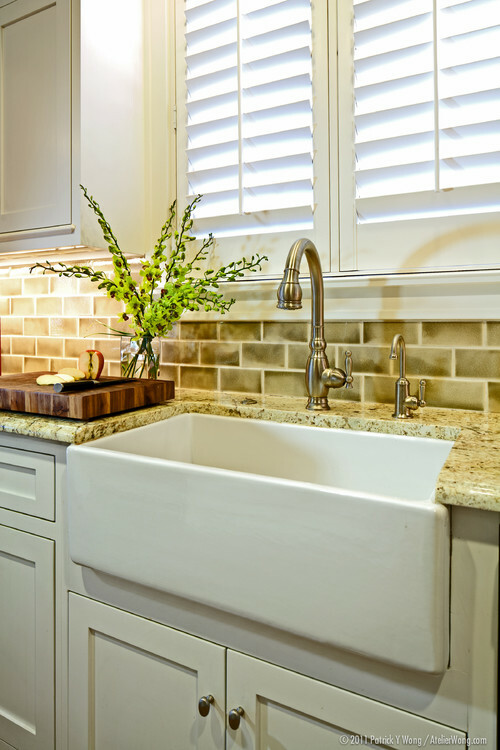 Try to find a faucet that lends itself to the overall look that you want to achieve. A shiny new faucet will help to liven up a tired space. 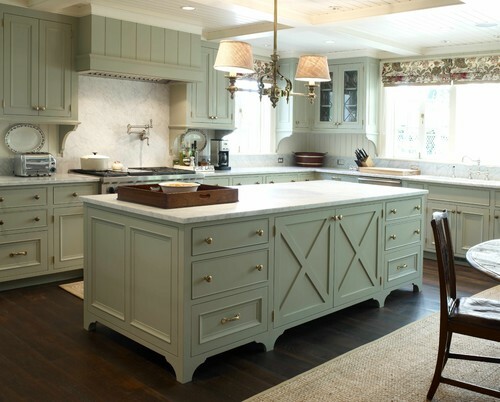 One of the easiest ways to add a customized look to a kitchen is to add feet to the cabinets. One way to do this is to add split posts legs to achieve a furniture look. Another way (as seen above) is to add an arched inset in front of the toe kick. An inset can be made by jig sawing an arch into a 1″x4″ length of wood. Finish it to match the cabinets and attach. Further detail can be achieved with shoe molding, if desired. Add height to your cabinets. If you have just a bit of space between your cabinets and the ceiling (say, 10″ or less), instead of adding crown molding to the cabinets, first add some molding to box out the empty space. Then, place the crown at the ceiling. 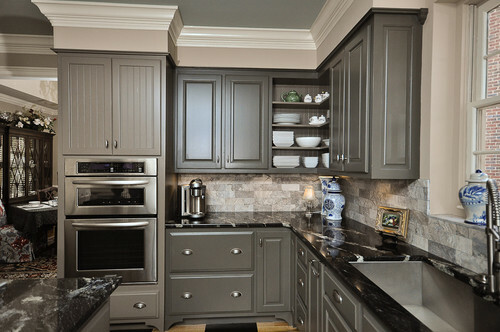 This can not only turn 36″ cabinets into a taller cabinet, but it also adds a designer finish. 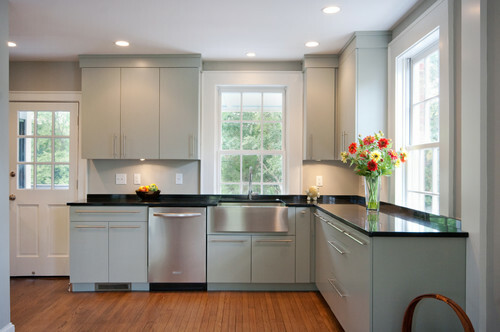 Molding can also be used to camouflage cabinets that are under a soffit. 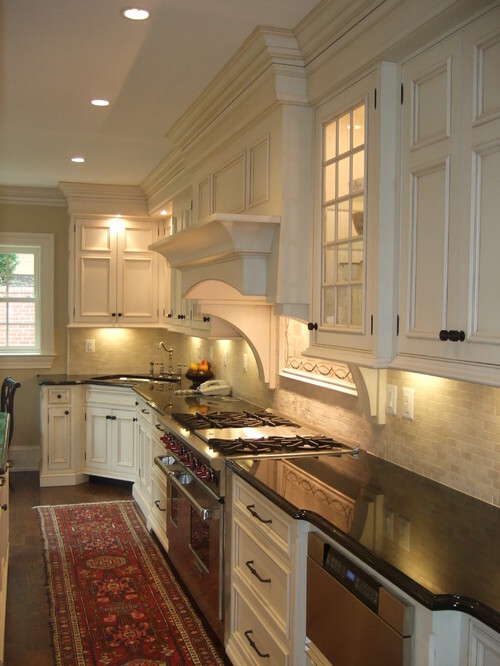 Use a small crown to ease the cabinets into the soffit. Then, add a larger crown at the ceiling. Finally, paint all the trim and the soffit to match the cabinets. If you have the budget, fill even larger spaces with a second cabinet stacked on top of your main set. This is a good way to raise the height of your cabinets and fill in the space for higher ceilings. Change out a few cabinets panels for glass. Anytime that you can do something to break up the flow of a set of even, solid colored doors, it will lend to a customized look. (Unless of course, you are going for a Mid Century Modern look). 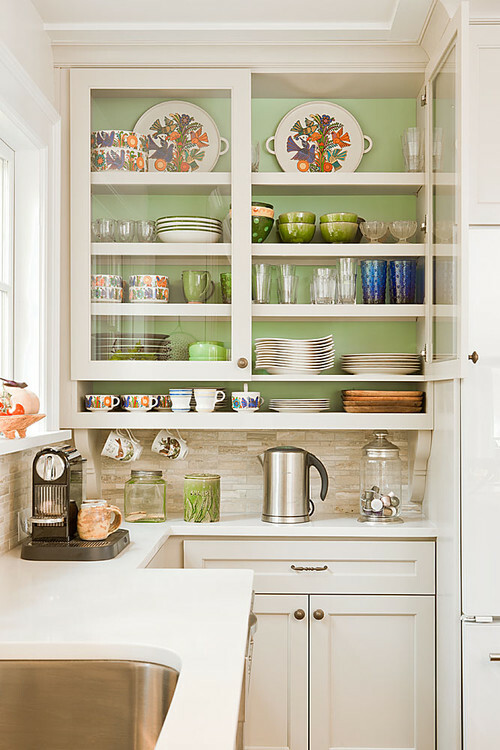 Use a select set of cabinets to convert to glass and use it to display your best dishware. In keeping with that same idea, open shelving can also be created. Remove a few select doors and finish the interior of the cabinet to match the finish of the exterior. 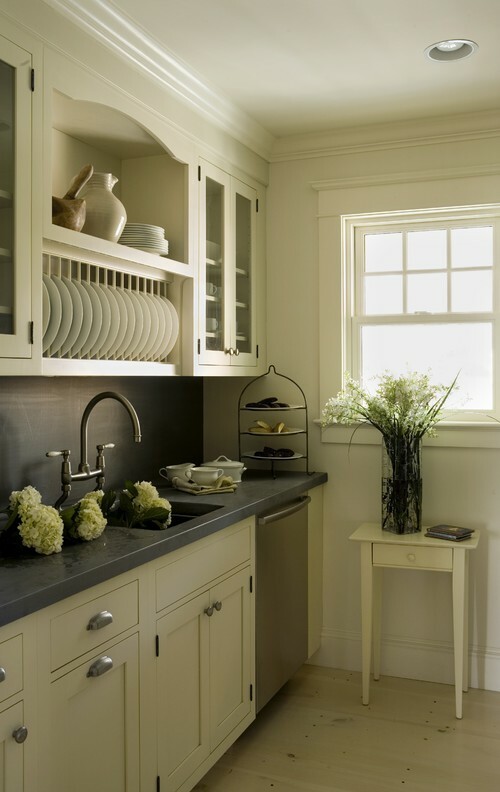 Another great idea to add some customization is to remove the doors from a set of raised cabinets. Finish the interior to create a display cabinet. Then, install a DIYed plate rack beneath. Plate racks are a relatively easy project for the average DIYer. Plus, it gives a nice customized space for storing your plates. (Another great DIY storage for dishware is my dish drawer). Finally, don’t underestimate the power of some good lighting. 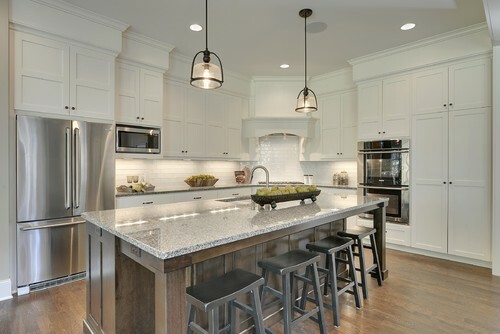 Add under mount lighting to help soften countertops and to create an elegant mood.